Maine and Greg are a natural union. With his award-winning draftsmanship and composition, Greg does honor to the spartan farmhouse, the well worn skiff, or the rusty chain emerging from granite. With a degree in fine arts, Greg chose to live on the Maine coast after studying classical and contemporary art in France and Spain. Besides running McGrath Dunham Gallery, a comprehensive gallery in Castine, Maine with his wife, Pat. 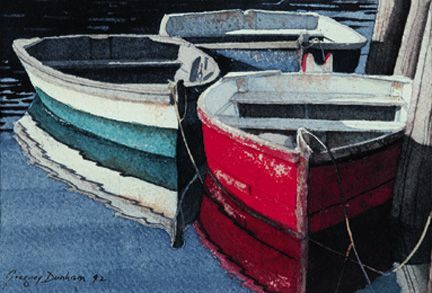 He also shows with Guild of Boston Artists at 162 Newbury Street, Boston and Rockport Art Assoc., 12 Main Street, Rockport, MA.